Home » Acoustic guitar » Mel Reeves – Play Jazz Guitar Now! Mel Reeves – Play Jazz Guitar Now! Mel Reeves Play Jazz Guitar Now download. At last, Mel Reeves – the country’s leading writer & presenter of music tuition videos – has turned his attention to the world of jazz guitar. Whether you are a true jazz fan or simply want to add a little jazz to your armoury of guitar styles you can now learn how to play those cool chords & stunning solos. Special features: Styles, Instrumentals, Theory & Technique sections are in chapters for easy access and learning. 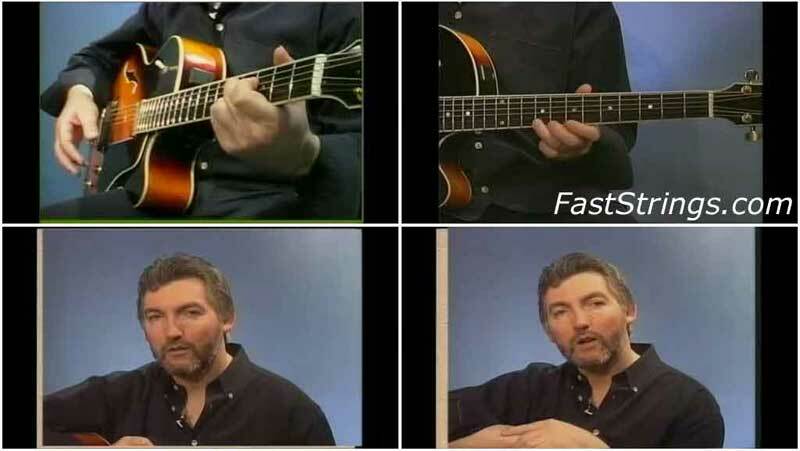 Using Mel’s method you really can Play Jazz Guitar Now! This is an excellent guide to the basics of jazz guitar. Mel Reeves breaks down all the foundation techniques into simple, bite size chunks. You’ll learn the II – V – I progressions (foundation of most jazz standards), comping skills, and how to solo over those progressions. Mel keeps the theory to a bare minimum, whilst teaching more advanced concepts such as altered dominants, chord substitution, and the jazz minor scale. Best of all, you do not need to read music, or understand theory. The information is clearly shown onscreen, or in the accompanying booklet, and Mr Reeves explains it all well. There are also simple memory tricks taught that will help you remember the more advanced techniques. Ideal for those of us coming to jazz after years of listening, or for the rocker or blues guitarist hoping to add some jazz flavors to his style. Whilst this tape is geared towards intermediate players, even beginners will get something they can use. Stick at it, and you might give George Benson or Pat Methany a goodrun for their money! thank you so much from france. it’s great! !